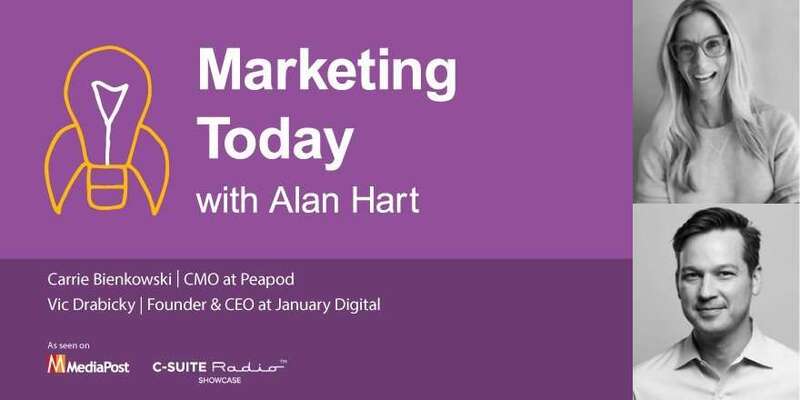 This week on “Marketing Today,” Alan hosts two guests. Carrie Bienkowski is CMO with Peapod, the online grocery ordering and delivery service. Prior to her time with Peapod, Bienkowski was based in London as head of fashion for eBay, and, previous to that, she spent 10 years in marketing with Procter & Gamble. Vic Drabicky is the founder and CEO of January Digital, a digital marketing agency, consultancy, and analytics firm working with brands ranging from David’s Bridal to Diane von Furstenberg, Oscar de la Renta, and Vineyard Vines. During the course of their conversation with Alan, Bienkowski and Drabicky reveal the thinking behind the ways they operate and the ways their companies work together. And the dynamic nature of this in-tandem podcast episode leads to greater insight as the Bienkowski and Drabicky build on each other’s points.